EKM has some great potential and with some amends to it’s technical SEO capabilities, EKM can easily rival Shopify in my opinion for OOTB proficiency, from an SEO standpoint. In my opinion, based on in-depth reviews and experience, there are better alternatives out there for an e-commerce website at this price bracket. Like with a number of platforms there is a cap out point, and as a business you can cap out very quickly with EKM — if you’re a small business looking for a scalable solution for your e-commerce store, I would go with Shopify over EKM. Whilst not an enterprise level platform, if you don’t want to use WordPress WooCommerce, Shopify is the next best alternative. I also love that EKM are attempting this evolution mode idea, and trying to add value to users – but I can’t see any value on any of these sites from an SEO perspective, and based on some of the advice and communications I’ve seen them have with clients, I’m concerned about their expertise level – especially around SEO and website technical basics. Also based on feedback I’ve had from EKM customers, I’m not sure what value evolution mode adds. February 2019 Update – following reading this article, EKM have made some updates to their platform to make it more SEO friendly in places. EKM acknowledging issues raised within this article and acting accordingly. For small to medium sized businesses, there is a lot of choice when it comes to selecting an e-commerce platform. In recent months one in particular has caught my eye through a lot of advertising on Twitter and YouTube, EKM. Having worked with a lot of ecommerce websites, I’ve only ever personally come across the platform once, despite it’s high volume of ratings, and the claim they have more than 50,000 customers. If you’re using ekmPowershop the answer is usually not much, as most of the SEO work has already been done for you. 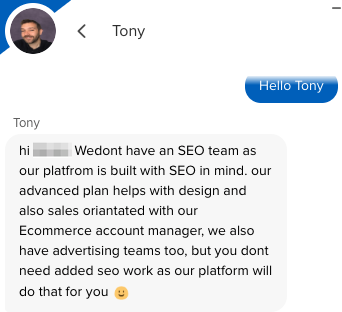 This is quite a claim for any ecommerce platform that it’s 100% SEO friendly out of the box, especially given the issues faced by enterprise level platforms like SalesForce Commerce Cloud, Magento, Hybris… And even WooCommerce/WordPress (which is typically one of the more SEO friendly platforms OOTB). Now they are sending me details of adding on their ekm healthcheck for search engine optimisation for £350 + VAT but they will knock me £100 off. Saying they can get me to the top of google and direct traffic to my site. So in 2014, EKM were apparently offering an SEO package to users that contained meta keywords, but I cover their meta keyword advice in more depth later on. Also, link building suggestions, before and after report? How do those two work together when studies have shown it can take up to 22 weeks for the effects of link building to be felt. So I’m curious to know how the before and after report can show any type of causation from these recommendations – unless a) the site is super niche and b) it was that under-optimised previously changing the title tag to something relevant was revolutionary. A review of a list of 13 websites sent to me via email by Tony Rushe, an Account Manager at EKM as examples of live sites. Conversations with EKM live chat executives and their responses to technical related questions. Top line: The websites provided as examples all had issues on mobile, in terms of elements being too close together, elements not readable… Rather than responding to smaller viewports page elements just appear to get smaller. Given Google has now pretty much moved all sites over to the mobile first index, issues like this can be key in maintaining performance. On a top level, all of the sites had missing viewport <meta> tags in the <head>. Ok, so a H1 on a product page – that’s standard, however what’s interesting is that in the code there are two H1 elements, one for mobile and one for desktop. H1 is also used to style the “search” text. Whilst this isn’t a major issue, a lot of value can be place in maintaining sound information architecture. Back in 2015, Google said that page titles (aka title tags, meta titles) and H1s should be consistent for rankings. However there is a difference between something being consistent, and something being the same. Consistency is key. One thing we always try to get right is extracting your headline. And if there are different places on the page that point to different headlines, that’s very confusing for the bot. Across all the sites I look at, all of the title tags and H1 tags matched, meaning you had search results with categories literally with the title tag “Jackets” or “Dresses”. Not being able to define separate page titles (H1s) and title tags is a big optimisation opportunity cost. And in instances were the use of ALL CAPS is great for the on-page H1 (if styling allows), but couple that with a long product name and the resulting title tag just looks spammy. Using the example of dresses and jackets, I’d have wanted to optimise the title tags for better information architecture, better user experience (and CTR from SERPs), and inclusion of search phrases to match a variety of search intents. We also know from various studies and experiments that title tags carry a reasonable amount of weight as a ranking factor in Google. Awesome that you can edit the meta descriptions of your pages, but looking at the thirteen sites, using a site: command, very few are optimised beyond the homepage. So the second point here, meta keywords. Matt Cutts went on record in 2009 in various videos and blogs talking about how Google doesn’t use meta keywords, so it’s a little bit shocking that someone would advise paying customers to use them 9 years later. For reference, here are the meta tags that Google does support, and here is a post from their official webmasters blog on the subject. Our web search (the well-known search at Google.com that hundreds of millions of people use each day) disregards keyword meta tags completely. So it’s disappointing that a modern, forward thinking cloud-based platform still includes this field as something for their users to get distracted by. EKM updated the article on February 19th 2019 to accurately reflect how meta keywords are treated by search engines. 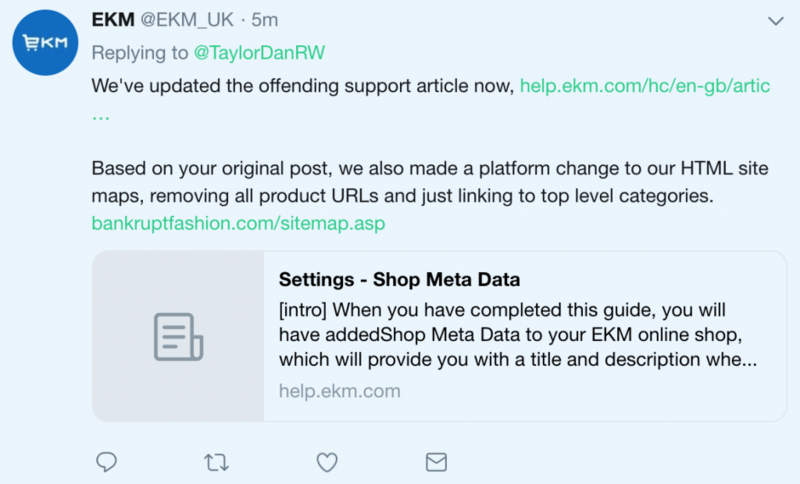 It is important to highlight that you cannot add custom meta titles and descriptions to your EKM store “out of the box”, you need to install a Custom Meta Data plugin to be able to do so. You can however upload title tags and descriptions via CSV, so at least if you’re managing a scalable e-commerce store – you have some form of scalability. By this, they mean a HTML sitemap – which is good, as it helps with crawling, and helps other search engines such as Bing. There are 1,766 links on the page (in total). That’s huge. Internal linking structures are vitally important, and resolving them can reap huge SEO benefits, to have a single page on the site is detrimental. With a HTML sitemap, not every single product URL needs to be included, and as EKM is an ecommerce platform, this is a bit of an oversight and is creating pages damaging to crawl efficiency. Why are these large HTML sitemaps an issue? They’re an issue because of internal linking. As SEOs, we tend to use a rule of “100 links per page”, and this in part goes back to the days of PageRank sculpting. With PageRank sculpting, you wanted to sculpt internal links to pass authority to key pages within the site. The “keep the number of links to under 100” is in the technical guideline section, not the quality guidelines section. That means we’re not going to remove a page if you have 101 or 102 links on the page. Think of this more as a rule of thumb. Whilst this is a rule of thumb, hundreds (or 1,000+) links on a page is detrimental. Tags I personally wouldn’t include based on experience. None of the thirteen example stores had speciality XML sitemaps, all pages (products, hygiene) are bundled into a single sitemap. Will this affect Google crawling the website? Not at all. Will it affect an SEO’s ability to use Google Search Console to it’s full potential and identify indexing issues? Yes. I also crawled the thirteen XML sitemaps, and found that a lot of them contained non-200 status code URLs. These URLs should be excluded from the XMLs to prevent wasted crawl resource. This is actually really useful, and out of the box this can instantly make a small/medium sized business more competitive within organic search. So, that’s the end of the list included in EKM’s SEO support article. So the rest of the analysis is done based on reviewing the thirteen example websites. Do EKM products have an issue with being indexed by Google? In order to test this, I chose 10 products at random from each of the 13 websites, and attempted site: on them to establish if Google was indexing the URL. Out of the 130 products, only 103 were indexed and returned a URL through a site: command. This means ~20% of the products I tested weren’t being indexed by Google. This is something common on a number of SME level e-commerce platforms, and is something I’ve come across on other platforms such as Shopify (especially during this webinar, were we reviewed Lauren Moshi). This can be resolved through better internal linking. Does EKM have native blog functionality? Not that I can see. Some websites I’ve found on EKM do have blogs, but they are WordPress installs reverse-proxied to a /blog/ subfolder. The WordPress blog feature is actually promoted to users, with instructions on how to install. This isn’t a bad thing, as a WordPress blog is a great thing to have – however every one I’ve come across hasn’t been covered by the SSL, covering the EKM main platform. It also doesn’t appear that EKM’s customer support and “evolution mode” extends to helping customers get the most out of their WordPress blogs at a basic level. This is concerning, as an out of date, or insecure WordPress platforms can lead to serious security breaches, even if they’re not the primary platform. This is a security risk that I’d love to see EKM address for it’s users, especially in a post GDPR era. Can EKM support Href lang? In short… No. During a live chat with one of their representatives I asked this question, about whether or not I can implement Href lang from my online store – and I was advised that I should setup individual EKM stores (one for each target language), although none of them would be be connected by Href lang, a single database… Or share the same database. I can see this working (of sorts) if you’re targeting say Great Britain (English) and Spain (Spanish), but if you’re targeting multiple countries with the same language (UK, Ireland, US…) this would just cause duplicate content issues. All of the EKM stores have a flat URL structure, with everything sitting on the root. This structure will not only provide better architecture, but also enable better analytical analysis, making for better data led decisions. When measuring site speed, I love to use Google’s official page speed insights tool, however all of the thirteen websites returned an “unavailable” when checking the speed, apart from one – which actually scored the best on the optimisation scores (mobile and desktop combined), clocking in with a fast 1.3s FCP 1.2s DCL. They did however return the optimisation statistic (out of 100) for all thirteen sites. EKM performed worse on desktop than it did on mobile in terms of speed optimisation for the sites sampled. Similar to Shopify, the robots.txt for EKM platforms appears to be standardised across all EKM websites. Whilst nothing in the disallow:’s looks out of place, there is one interesting inclusion at the bottom of the .txt list… A crawl-delay! Simply put, crawl delay is not a search engine friendly command and I strongly doubt any of the EKM websites (seeing as they have annual revenue limits of £1million on their highest paid plan) command such excessive crawl budgets. However, this does make more sense if all the sites (or a lot of them) are sharing the same servers, and this is to prevent successive commands causing down time. Avoid using the crawl-delay directive for search engines as much as possible. So all this is doing is harming other prominent search engines in the UK, such as Bing (which in my opinion has difficulty crawling deep links of a site anyway), and I’ve never, ever known Bing to be an aggressive crawler. Looking at latest data, Bing holds a market share of around 12%, so 1 in 10 people use the search engine – that’s a significant number when you’re an SME looking to attract business online. Impressively, yes. Aside from the menu drop downs I was able to navigate the websites without restriction or loss of content. The only schema I was able to find was breadcrumbList, which is a shame as there are opportunities (out of the box) to include things like product schema on the product pages, and other options to include things like organisation schema. I also know from EKM’s documentation that users can inject custom HTML into the head, so Organisation/LocalBusiness should be included – unless the EKM team haven’t advised this for some reason. I tried to crawl a client’s EKM website using Sitebulb, throttling down knowing it’s on a shared server (and probably not a good one), and I was right. I reached out to their customer support team and your website could be on a shared server containing up to 150 websites. That’s astounding. I have been to speak to the server engineers and they have advised that they can unblock the IP address that was crawling the site, but they are advising against doing this as it was causing a massive drain on the servers resources and as such will slow the site and in some cases cause it to temporarily go off line, as we experienced on the call, If it is something your SEO wants to do we would recommend running this in the evening when less demand will be placed on the site anyway. Ok, so the server they are using is made of rich tea biscuits, and likely shared. Also in the evening, that’s when that site is at its busiest. Great advice. I was able to crawl the site mimicking an Icelandic IP and using 1 console (it took forever). Is EKM good for SEO? If you’re a small/medium sized business looking to sell online, enterprise level solutions such as Magento, SalesForce and Hybris come with hefty price tags and development challenges. However, that being said – from working with a number of e-commerce platforms over the years, I would choose Shopify ahead of EKM. For the out of the box issues, I feel Shopify is a much more workable platform and a lot of the SEO issues I’ve come across can be resolved with some tweaking – even on site’s pushing £2million+ in annual online revenue. EKM has some great potential and with some amends to it’s technical SEO capabilities, EKM can easily rival Shopify in my opinion for OOTB proficiency, from an SEO standpoint. Like with any platform however, you need to utilise your own suite of tools, ranging from keyword tools, to analytics and brand monitoring. However, like with a number of platforms there is a cap, and as a business you can cap out very quickly with EKM, so I’d go with Shopify from a scalability standpoint. I also love that EKM are attempting this evolution mode idea, and trying to add value to users – but I can’t see any value on any of these sites from an SEO perspective, and based on some of the advice and communications I’ve seen them have with clients, I’m concerned about their expertise level and that they see it as a chargeable service in it’s current manifestation. Are you using EKM Powershop for your e-commerce business? Or exploring platform options? Please get in touch if you would like to speak to an experienced e-commerce SEO professional. Good write-up Dan, and thanks for quoting our robots.txt article!